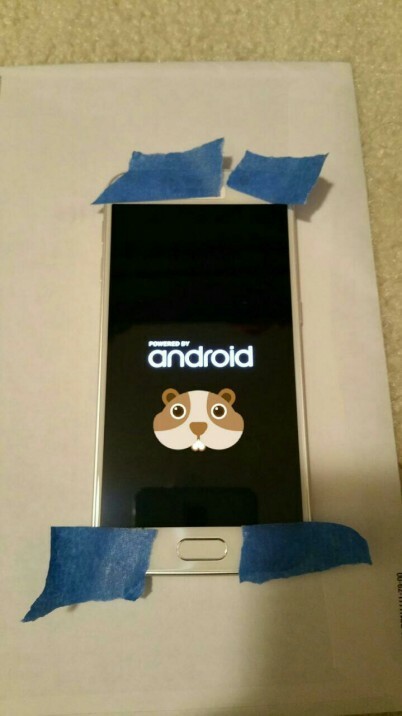 Update: The Galaxy S6 Edge also seems to have leaked in these official looking press renders. Starting from the front of the device, the proximity sensors appear to have been moved to the left of the earpiece this time around by Samsung. You can see the IR sensors on the left of the earpiece above. The home button for the Galaxy S6 also seems to have undergone a design change, with Samsung having chosen to make it wider. Aside from these minute changes, there seem to be little design overhaul for a flagship categorized as ‘Project Zero’. The metal unibody and the premium look it offers is glaringly visible however, with the side curves and the overall form factor of the Samsung Galaxy S6 blending quite well as a whole. 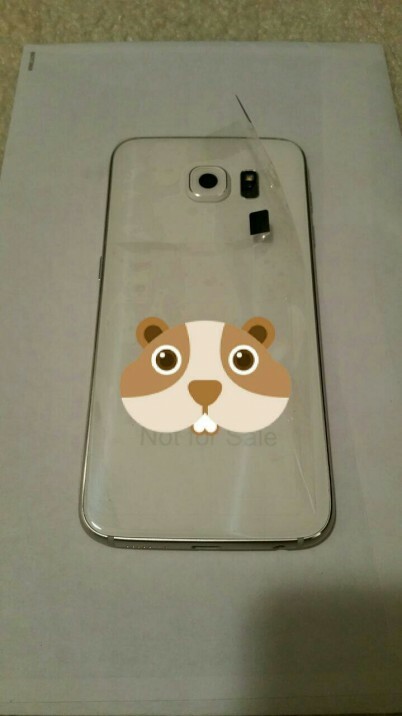 You can take a look at both the Galaxy S6 and the S6 Edge in another leaked image below to get a better idea for yourself. As expected, the Galaxy S6 Edge features a dual edged screen, as opposed to the singular one found on the Galaxy Note Edge. The home button however is now a fingerprint sensor according to the source of these images and unlocking the Galaxy S6 will now be as simple as a simple tap. In addition, while we’re on the topic of the Galaxy S6’s manufacturing material, the rear of the device is covered with glass, as had been speculated previously to assist in wireless charging on the device. After Samsung’s wireless charger made an appearance at the FCC, today’s leaks add more credibility to the feature present on the device. Take a look at it below. Aside from the glass back on the device, that can be pictured above, Samsung also seems to have made some minute changes to the rear design of the Galaxy S6. The camera lens has been modified and the flash is now on the right side of the lens, as opposed to the bottom of the Galaxy S5. True to its position, the flash is now present on the Galaxy S6 in a vertical arrangement, coupled with a heart rate sensor. Moving on from the overall design, lets take a look at the volume buttons and other features on the upcoming Samsung flagship. The leaked device is a AT8T prototype by the way, and the leaker has made several attempts to cover his/her tracks, as is evident. 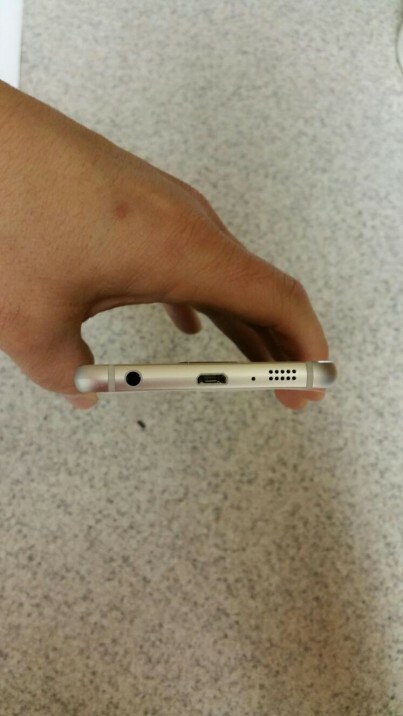 Another design change on the Galaxy S6 seems to be on the volume buttons for the device. Samsung’s replaced the volume bar from the Galaxy S5 to individual volume buttons on its upcoming flagship, moving towards a feature found on rival Apple’s iPhones for quite a while. 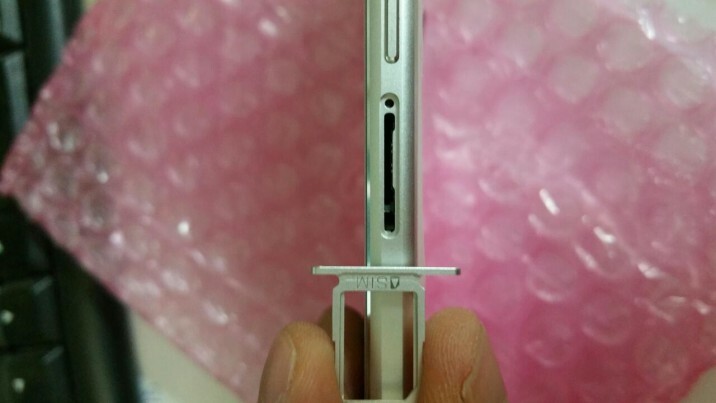 Moving towards the SIM card slot and Micro SD port for the Galaxy S6. 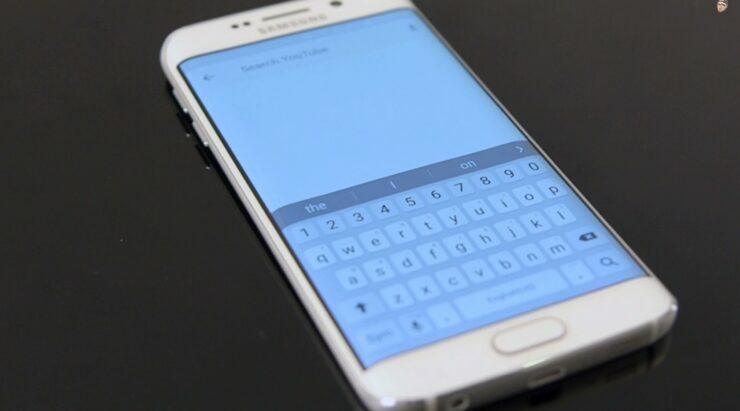 There appears to be no memory expansion slot on the Galaxy S6 this time around. You can take a look at the SIM card slot below. The little plastic cover on top of the USB port for the Galaxy S5 also seems to be gone for now, with Samsung choosing to stick with a much simpler interface at the Galaxy S6 bottom, no doubt to improve user experience. Both the speakers and the headphone jack also have found their places on the bottom of the device, reminding us of the design followed on the iPhones by Apple. Looks like the Korean manufacturer has decided to borrow more than one leaf from its Cupertino rival this time round. Take a look at it below. Another thing unchanged on the Galaxy S6 is the device’s display size. 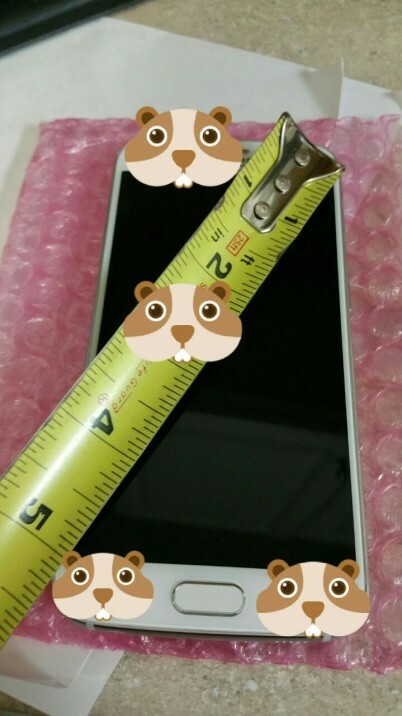 Samsung has stuck to the 5.1 inches found on the Galaxy S5, and we’d agree with the Korean manufacturer on this one. 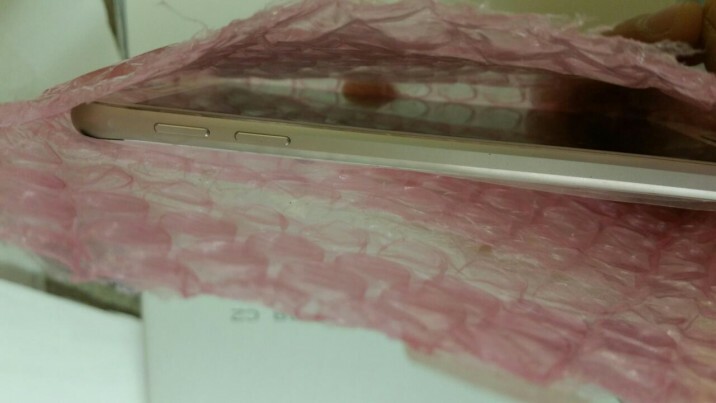 Call us distasteful, but the Galaxy S5 appeared to be a little too big for its form anyways. 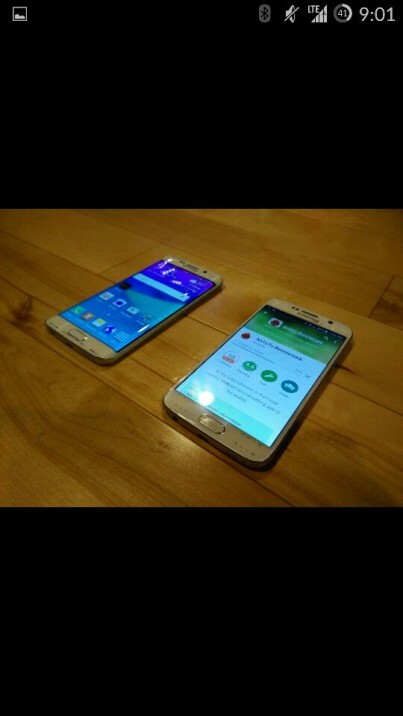 Perhaps the metal body and rather refined design of the Galaxy S6 will do the size justice. The device also appears to be quite sleek, so that can also be considered an improvement. 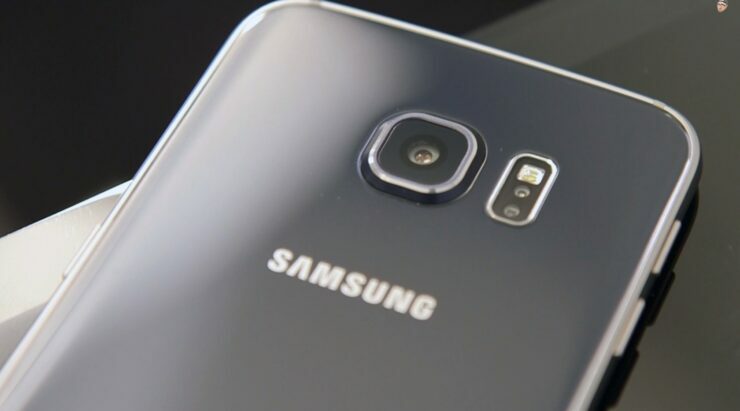 And finally, today’s leaks of the Galaxy S6 won’t be complete without a picture of the device powered on.Today’s appearance of the Galaxy S6 manages to cover nearly every single aspect of the device, making this leak one of the most complete device leaks we’ve seen in recent times, comparing perhaps only to the HTC One M9’s massive leak yesterday. Furthermore, the prototypes pictured seem to be running on Android 5.0.2. Take a look at it below. So that completes our analysis of what we should expect from the Samsung Galaxy S6 and the Galaxy S6 this coming month. Design was the only feature of the device missing from the rumor/leak mill for the device, and today’s pictures complete the picture for us on Samsung’s flagship. Overall, we’d give the Galaxy S6 6/10 when it comes to design changes for the device. Samsung’s seems to have not quite caught the gist of the seamless integration of design on smartphones so far, but the Korean giant known for its top notch specifications does seem to be moving in the right direction. The metal body, improved ports on the bottom, the volume buttons and the fingerprint sensor are all features that needed much improvement from the Galaxy S5. Its successor manages to get them right, but overall, something still seems to be missing on the Samsung flagship. So take a look at the images above, and let us know what you think in the comments section. 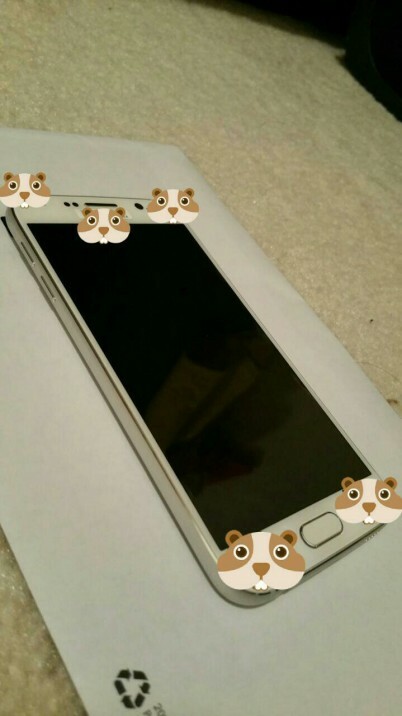 Update 2: Some more pictures of both the devices have popped up, confirming what we already know about the Galaxy S6 and the S6 Edge. And as pointed before in yesterday’s press render leak of the Galaxy S6 Edge, the Edge counterpart of Samsung’s upcoming flagship does look much better indeed. Take a look at them below. And here’s a neat little video nicely summing up all that we expect from Samsung’s upcoming flagship. Cheers.